The rope, a prime necessity for the elevator industry, was used by early man to cross rivers or ravines; later water-balance and steam-driven funiculars conquered the mountainsides. However the elevator industry was primarily concerned with lifting materials, then people, vertically. The philosophy changed when it became necessary to move multitudes a short distance to underground, or elevated, rail stations and the industry became concerned with the development of the escalator. Engineers and manufacturers were energized to create safe, efficient equipment that would continuously convey passengers, hour after hour, quite different from the swifter vertical elevators that raised passengers in relatively small batches. 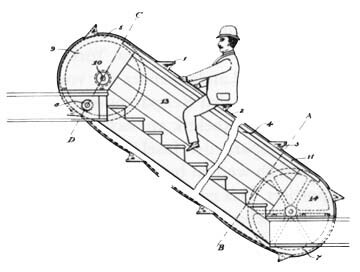 It was a small step, thereafter, to flatten the escalator and design moving sidewalks and ramps. The funicular, developed in Europe, did well where a fairly unencumbered landscape allowed the laying of tracks. When this was not possible engineers created mechanized ropeways that glided over gorges and rough ground. The large capacity gondolas were counter-balanced in the beginning but then it became necessity to move greater numbers to the heights. A circulating string of cable cars provided an answer, similar to the moving sidewalks and stairways on ground level.. A close relative to the chain of aerial cabins was the continuous motion paternoster, invented in England and much utilized in that country and Germany. Finally came the ground-level horizontal people mover, often described as, "an elevator laid over on its side". Naturally the companies involved with vertical transportation saw PRT's as their field to conquer. After World War II when it became necessary to place millions of Europeans under cover, quickly and economically, the escalator was manufactured in one piece, as a package. In a few instances elevators were installed a fair number of degrees from the true vertical and it could truly be said that the elevating discipline could no longer be termed "the vertical transportation industry" rather the "short-range multi-directional automated transport industry"!